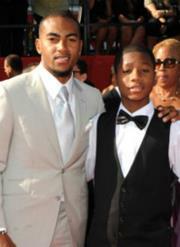 My Wish and DeSean Jackson grant Donovan Troy’s wish of spending time with his favorite NFL player. Nothing, not even an unexpected rainstorm, could ruin Donovan Troy’s wish. In fact, the weather made Donovan’s day even better. 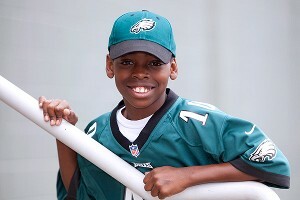 Troy, a 10-year-old from Atlanta, spent the rainy day inside the Philadelphia Eagles’ practice bubble with his idol, DeSean Jackson. One month after he was born, Donovan was diagnosed with a life-threatening form of sickle-cell anemia. Donovan had to avoid situations that could exacerbate his condition, such as being outside in extreme heat, or even swimming. Football specifically was discouraged, especially after Donovan’s spleen was removed when he was a toddler. He now needs monthly blood transfusions. Contact sports could create serious complications. Donovan’s uncle, Cedric, was 32 when he died from the same condition. But Donovan loved football, and while his parents wanted to protect him, they also didn’t want him spending his whole life in hospitals. Donovan Troy was diagnosed with a life-threatening form of sickle cell anemia when he was a month old. When he was 5 years old, Donovan played football for the first time, on a team coached by his father, Al. Donovan played a little bit of quarterback and had some success, but for his health, he took the next two years off. At age 8, he scored his first touchdown, though he was decidedly low-key about it. Now, whenever Donovan gets a chance, he imitates Jackson’s touchdown dance. How the youngster from Atlanta became a fan of the fifth-year wide receiver from Philadelphia remains a mystery to his family. At the end of May, his parents set up Donovan with a special highlight video in his normal playlist. After a clip of Jackson’s season highlights finished, Jackson popped on the screen to deliver a personal invitation to Donovan. At first, Donovan didn’t believe he was really going to Philadelphia, and kept replaying the video. And then it finally sunk in — Donovan would get to meet the man he had idolized for so long. Two weeks later, Donovan and his family were off to Philadelphia, where he met Jackson. Donovan shared Jackson’s locker and received his own customized jersey, which he took onto the practice field. 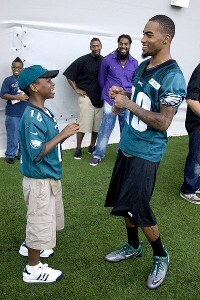 DeSean Jackson showed Donovan some of his best dance moves. Of course, no practice for Jackson would be complete without getting some work in with his quarterback, and that was the case for Donovan, too. After a little one-on-one coaching from Jackson on running routes, Donovan caught passes from Eagles quarterback Michael Vick. “Once [Jackson] showed him how to run routes, he got to catch passes and didn’t drop one the whole time. That was really cool for him,” Tara said. After the film session, the day at practice was nearly over, but there was still one last surprise in store. Jackson, an avid rapper who has his own label — Jaccpot Records — brought Donovan to a recording studio and had the youngster lay down a verse for an Eagles rap. Back at home, Donovan plays the song every day, and it’s his mother’s ringtone. Donovan now plays baseball instead of football because it’s safer, but he’s still dancing. Only now, he’s doing it to his own beat. The billboard over I-95 South just before Lincoln Financial Field shows Eagles star DeSean Jackson with Upper Darby bullying victim Nadin Khoury. It reminds me of the most effective defense against bullying: us. By us I mean members of society, the spectators in the stands. On the billboard, alongside the words “End Bullying Zone” our favorite wide receiver uses his celebrity to cast anti-bullying as popular, socially desirable goal. Think about it. If others (read: we) don’t stand around and watch the bully, laugh at insults, or chant, “fight, fight, fight!” then the bully has no audience, and thus, no act. Summer break doesn’t stop bullying. It happens on the playground, at the pool, on the block. 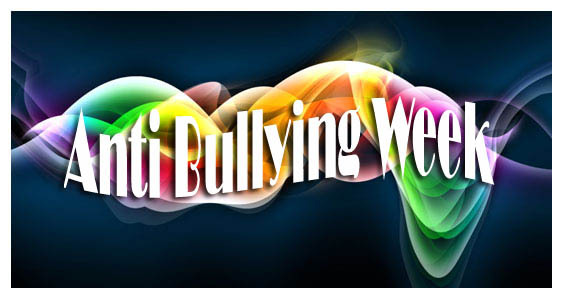 Adults encounter bullies in the workplace, the boardroom,–heck, in the state legislature. The “him” was my neighbor’s kid who sat silently against a fence. As the bully and kids approached, I did too, aiming a disapproving “Mom” look at the bully and his curious followers, who were drawn by anticipation. After several glances at me, they all slinked away. I didn’t get a chance to talk to Jackson or the folks behind his DeSean Jackson Foundation, headed by mom Gayle Jackson (she was away at the Professional Football Players Mothers’ Association’s 15th annual Pre-Season Conference). But I did talk to Nadin. Life has changed a lot since last year, when a group of bullies put him in a tree and recorded it. Yes, someone cares, Nadin. And that someone should be all of us. 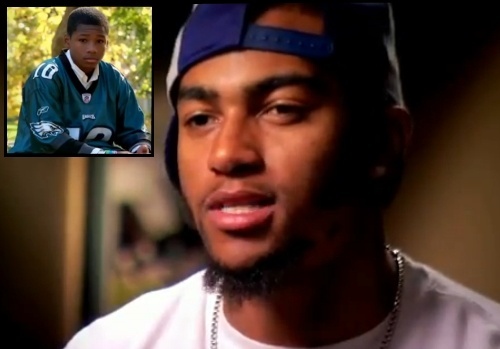 For more information on the DeSean Jackson Foundation, go to Foundation10.com or E-Mail Mrs. Gayle Jackson @ deseanjacksonfoundationceo@yahoo.com. Thank You.